I have always been a big fan of small containers. They imply the concealment and protection of something precious, something treasured – – or treacherous. The tribal cultures of Southeast Asia have produced some of the most beautiful and enigmatic small containers ever. Apparently I’m not the only one who thinks this way. 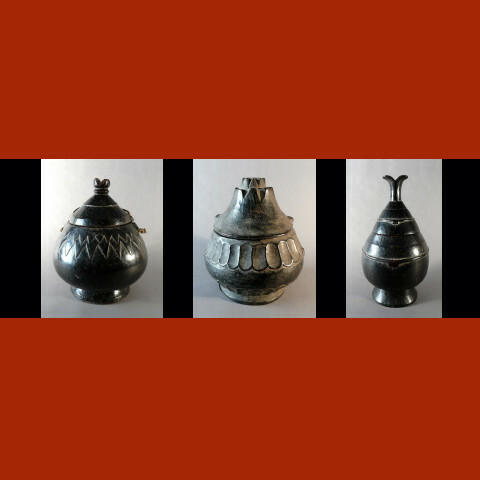 Tribal art dealer, Mark Johnson has put up a fascinating little online exhibition this month of small containers. Of course, good things come in small packages. But small packages can be very good things in their own right, as well. So if you can’t quite scrape up the cash to give diamonds in a small package, just give a small container instead. Some, like Mark Johnson’s, are treasures themselves, regardless of their contents or lack thereof. Take the three ceremonial feasting bowls above, for example.